50 keV 64Zn+ ions to a dose of 5 × 1016 cm–2 are implanted into substrates of single-crystal n-type silicon. Then the samples are irradiated at room temperature with 167 MeV 132Xe26+ ions with a fluence ranging from 1 ×1012 up to 5 × 1014 cm–2. 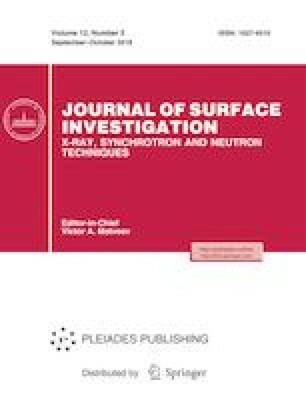 Changes in the structure and properties on the sample surface and in its body are studied by scanning electron microscopy, energy dispersive microanalysis, atomic force microscopy, time-of-flight secondary ion mass spectrometry, and photoluminescence. Original Russian Text © V.V. Privezentsev, V.A. Skuratov, V.S. Kulikauskas, A.V. Makunin, S.V. Ksenich, E.A. Steinman, A.N. Tereshchenko, A.V. Goryachev, 2018, published in Poverkhnost’, 2018, No. 9, pp. 67–72.